I believe it is important to share with you information about the Library as it, and the people of Summers County, will be the beneficiaries of the "Barns Project". An amazing amount of work has already been accomplished for the Library in a relatively short time by a group of dedicated individuals. With your help we can provide additional funds as they continue to exceed and excel. For many years the residents of Summers County were dependent on the "Flying Book Express". Long before the bookmobile was scheduled to stop services to the county, plans were underway for a permanent facility. A Board of Trustees was appointed by the Summers County Commission in 1976 and in August, 1977 a library was opened in a rented building. In 1982, Hulme K. Newlan purchased and donated an old bank building in memory of his wife, Pearl, to the Summers County Public Library Board. Combining funds raised locally with State and Federal resources, the building was renovated and the Library was dedicated in 1984. The new Library occupied the ground floor of the building. Realizing a need to utilize the entire building the" Friends of the Library" began an aggressive campaign to raise funds with plans for a elevator to the upper two floors and to double the space. Fundraising efforts were successful in part by the Hazel Davidson Memorial Fund and a generous bequese by John and Esther Moyer upon their deaths. On August 5, 2010 there was a big celebration when Director Myra Ziegler, Library Board President, Jack Ashley and Barbara Palmer, President of the "Friends of the Library" invited the citizens to an "open house" to view the latest improvements to the library. Of primary importance was the installation of the elevator. Now all three floors of the building are handicapped accessible and devoted to library use; a reading area on the mezzanine; meeting rooms for adult literacy classes and book discussions; SPOKES classroom for continued education; a break room for the employees and space to expand the current collections and public access computers. 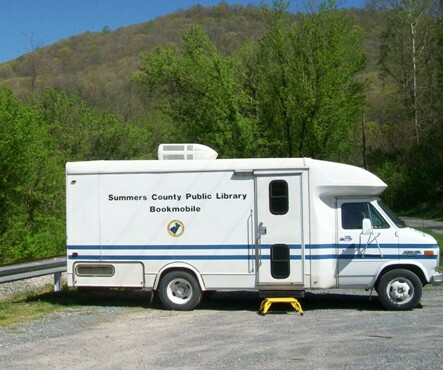 In 2012 the Library purchased a used Book Mobile, refurbished it, filled it with books and now travels to different communities in the county, to nursing homes and elementary schools. They share books, offered story times and other services. This project was made possible primarily from funds from the sale of the book, "Barns f Summers County, West Virginia Heritage" by native Phyllis Campbell Whitley. The books were designed and published by Mrs. Whitley and given to the Library. Thus, 100% of monies received from the sale of the book go to the library fund. Today the library houses approximately 136,000 items and lists over 5000 citizens of Summers County as active patrons. Parking is available in the City lot across the street and is handicapped accessible to all three floors. 33,117 people visited the Library and Bookmobile in the 3, 392 hours they are open annually. 25,824 books, videos, books on tape, etc. were checked out. 668 books, videos, etc. were borrowed from other libraries through interlibrary loan for use by our patrons. 1,811 items were added to our collection. 100 people were served by LAMP, the Library's adult education program, 24 of whom passed the GED. LAMP is funded by a $37,000 grant from the West Virginia Department of Education. 3 part time people are employed by LAMP. 3,367 people attended one of the 254 programs sponsored by the Library. 6,924 people signed up to use one of the Library's public access computers. An additional 1,107 people used our wi-fi. Librarians answered 2,704 reference questions. The library operates on a budget of $182,055. The library employs 2 full time librarians and 3 part time librarians. # LAMP is the Library's Adult Basic Education program. Operating funds for this program are not included in the Library operating funds. LAMP receives funds from a variety of sources including the WV Department of Education, Benedum and WV Literacy Foundation. It costs $25,000 per year to operate this wonderful program. The Friends of the Library have played an important part in the success of the outstanding advancement of the Library and continue to do so. Some members work continuously for improvements while others support their endeavors financially. Please consider joining the Friends of the Library. Your support is appreciated. To Join, please contact zieglerm@mail.mln.lib.wv.us and you will receive updates on their activities and accomplishments.